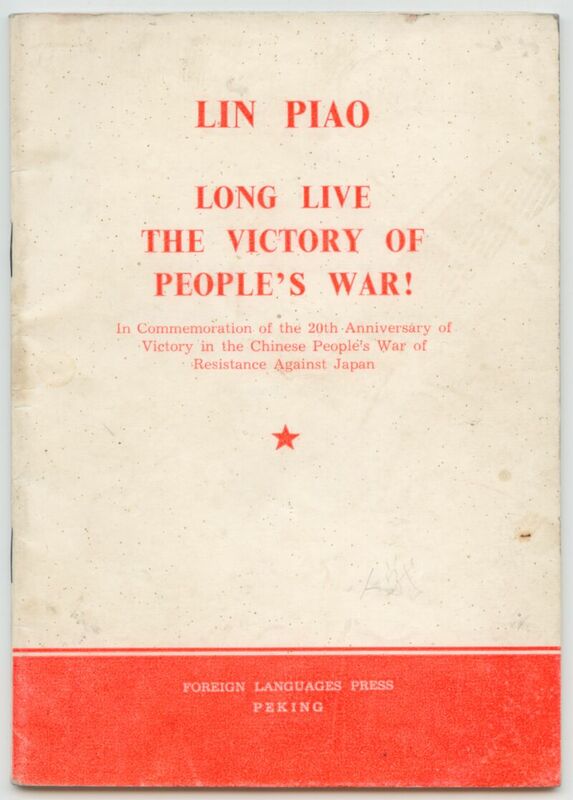 In 1965, to commemorate the victory of the Chinese Communists in the ‘anti-Japanese war' led by Chairman Mao Tse-Tung, a collection of essays by Lin Piao (or Lin Biao as currently translated) was published. The 20th Anniversary was an excellent propaganda opportunity and Lin Piao did not disappoint. This is a fascinating collection of essays presented in English for international friends. The colourful language used is a throwback to earlier times and is a great read. This copy was held by the library at the Northwest Finance and Economics College. It was published by the Foreign Language Press in Beijing in 1967, at the very beginning of the Cultural Revolution in China. Lin Piao was implicated in an attempt to overthrow Chairman Mao and was killed in 1971, following which his words and images were expunged from all official history accounts. The fact that this book survived after his downfall is remarkable and it is a unique book as it comes before the Cultural Revolution and gives a look at Lin Piao’s thoughts when he was still the devoted heir apparent to Chairman Mao. A fantastic piece of history. The book is in excellent condition and measures 13 cm x 18.5 cm.